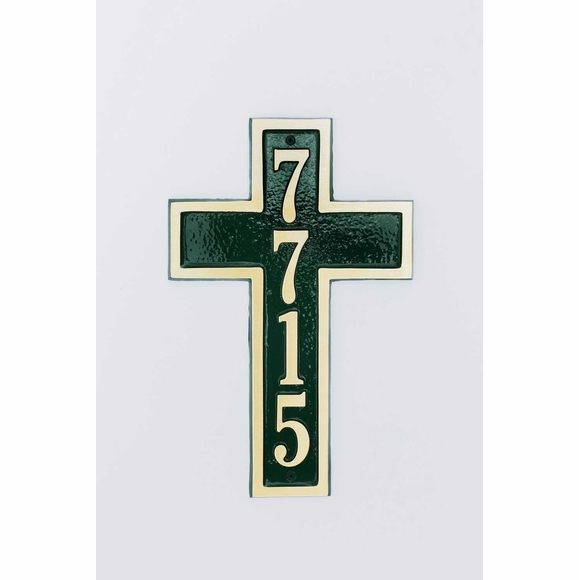 Solid Brass Christian Cross Address Plaque - - large 10"W x 15.5"H religous theme house number sign in upscale cast brass. Holds a four-digit house number. Made in the USA just for you. Solid cast brass construction with brass numbers and border. Plaque surface comes in 16 different colors. Personalization details: holds up to four 3" characters; vertical orientation. Finished with UV-stable polyester powder coat that is designed to withstand the harshest of elements and will not fade, chip, or peel. Powder coating was designed and developed to out-perform paint, especially in the coastal regions where salt has proven to be the number one enemy. Colors: forest green (1), gold (2), ruby red (3), navy blue (4), black (5), rust (6), burgundy (7), deep purple (8), silver vein (9), brilliant white (10), copper vein (11), patina (12), gold vein (13), white vein (14), bronze (15), natural stone (16). Includes matching powder-coated installation hardware. Dimensions: 10"Wx15.5"H; weighs 8.9 pounds. Custom made to order. Please allow 3 to 4 weeks for delivery. Also available in cast aluminum. Click top link in Related Products.